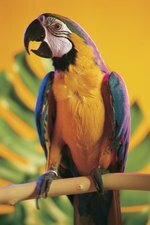 Visit an avian veterinarian as soon as you notice signs that your bird is ill, and keep your sick cockatiel comfortable in a special cage that provides a quiet, stress-free, warm environment. Cockatiels try hide their illnesses from owners and other birds; by the time you notice something's wrong, your cockatiel may need immediate professional intervention to survive. A sick cockatiel won't feel like socializing. Since a cockatiel will hide his condition, the best way to catch illness early is to have keen understanding of your cockatiel's behaviors while he's healthy -- that way you can spot abnormal behavior. Spend plenty of time with him daily, and you'll likely know right away any time he's not feeling well. Sick cockatiels don't feel like socializing. They hang out in the bottom of the cage and may cower in the corner. When you get an ailing cockatiel out to play, he may seem listless, bored or tired. If he's not his usual bright, energetic and talkative self, suspect illness. A sick cockatiel may eat and drink less and will likely stop singing. Some respiratory illnesses cause cockatiels to cough or make wheezing noises. You'll also notice an unwell cockatiel puffing his feathers up to keep himself warm. As soon as you suspect a problem, contact your veterinarian for an appointment. While you wait for your appointment, move your cockatiel to another cage. It's best to separate him from other birds until you get a diagnosis, and your bird will be better able to rest in a quiet spot. It's important to keep your cockatiel warm when he's sick -- his illness may prevent him from maintaining an appropriate body temperature. Install a ceramic heat lamp near the cage to raise one side of the habitat's ambient temperature to 75 to 85 degrees Fahrenheit. The bird can move closer to or farther from the supplementally heated side to regulate temperature. If your cockatiel has diarrhea, offer him plenty of fresh water with some added honey to help him rehydrate, or offer him a commercially prepared electrolyte drink. If you suspect a respiratory illness, place a humidifier or indoor fountain in the room to see if it helps ease symptoms. 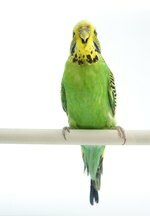 If possible, take a sample of your cockatiel's feces to the vet; it may help the veterinarian determine a diagnosis. Transport your cockatiel in a small, dark box lined with a towel. If the outdoor temperature is cold, warm your car's interior before you move your cockatiel. If possible, bring along a passenger to hold the box and speak quietly to your cockatiel to keep him calm during the trip. The veterinarian will examine your cockatiel and may take a blood sample. Before you leave the office, make sure you thoroughly understand the details about all prescribed medications. You should know exactly how much medication to administer, how often and when. Monitor your cockatiel while he recovers in his special sick room. Follow your veterinarian's advice and carefully monitor him for signs that he's worsening instead of recovering. Prepare the proper amount of medication in the eye dropper before you remove your cockatiel from his cage. Wrap him in a towel and hold him gently but firmly with one hand. Place your forefinger and thumb on either side of his head and introduce the eye dropper into his beak. Quickly dispense the medication. Give your cockatiel a small treat and calm him before putting him back in his cage.